This shrimp curry was so good, so special, that I had to make sure it was documented. Of course if you’re not into shrimp you can substitute chicken, and if you want to make it vegetarian you can use tofu. Use whatever vegetables are fresh and seasonal, although I happen to think the red pepper-string bean combo is perfect here. Steamed Jasmine or Basmati rice makes the ideal accompaniment (learn how to make perfect rice every time with my guide here). Once you try it, this easy and flavorful shrimp curry recipe will likely enter into regular rotation at your dinner table. Heat the olive oil in a large, deep skillet. Saute the garlic and onion until softened. Add the red pepper and string beans and cook for 5 minutes, stirring often. Stir in the coconut milk and curry paste and simmer over medium-low heat for 5 minutes. Add the shrimp and cook for 5 minutes, or until cooked through. Remove from the heat and stir in the lime juice and chili oil, if using. Serve with rice and garnish with chopped cilantro if you like. Gluten free To make kosher, use chicken or tofu instead of shrimp. To make vegan and vegetarian, use tofu or other vegetables instead of shrimp. I love Thai food, it’s definitely one of my favorite cuisines. We eat it pretty often and your curry looks amazing! I just dropped off my Tilapia Piccata, thanks for hosting! Curry is one of those things I’d like to learn how to make properly… yours looks delicious! Hello Katherine, I’m on vacations and I saw your bloghop on my email, I love this dish of yours, it’s one of my favourites! Have a good one my friend, hugs! I love your curry combination. Your image is so inviting and I can not wait to dive right in. Thank you for hosting the blog link. Enjoy your day! We’re new followers and new to the link party. Your Shrimp Curry looks fantastic. I’ve linked up my Lemon Shrimp. Thanks so much for hosting, looking forward to more of your tasty dishes. Have a terrific weekend! Your curry recipe looks outstanding. Off to share it on my page! Thank you very much for hosting! I love curry, this looks so delicious! Pinned! I love Thai-style curries – and that one looks amazing. I would be happy as a clam with a dish of that in front of me! Mmmm, this shrimp curry looks so delicious…I totally love Thai curry, so tasty. I absolutely love Thai style curries. I really liking mixing it up and using sweet potato or pineapple with other vegetables. Great post! I have some bay shrimp that I couldn’t decide what to do with…a coconut curry would be perfect. This looks wonderful, Katherine! Shrimp and Thai? I’m all over this!!! 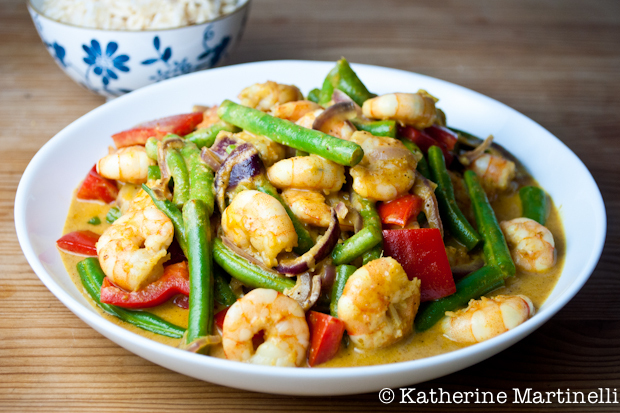 Great recipe and pictures Katherine – Shrimp curry is so delicious! I love seafood and this is a delicious Thai dish. oops–I forgot to let you know your recipe is now linked in my blog post too….thanks again! I don’t make curries weekly, but make them a lot. Mine are more Indian style. Although I like coconut-based curries, for some reason I’ve never gotten into the habit of making them. I should – they’re so easy, as your recipe points out. I agree green beans and red peppers are a fabulous combo, plus such a pretty one! Nice recipe – thanks. ohh Thai food is one of my favorites! I love red curries, and I swear I can smell this right through the screen 🙂 yum! Your shrimp curry looks delicious! I’m going to try it this weekend! Fun blog hop – love all the seafood links! I really want to attempt this prawn curry as soon as possible to search for the depth in flavour: – Using the basic spices + curry poeder + curry paste must have been a real balancing act! Am looking forwards to tasting the result 🙂 ! Like the fact you have used coconut milk rather than cream as coolant too!! Delicious recipe! I can’t wait to give it a try. Thanks for sharing. Beautiful dish. Congrats on Top 9! Well-deserved. This looks unbelievable! I can’t wait to try this out and get the taste of some of my favorite ethnic restaurants in my very own kitchen. Congrats on being in the Top 9 today! oh this is so yummy! It’s like comfort food to me! I love coconut milk cooked with curry and the rice definitely completes it! Wonderful recipe Katherine! I love a good coconut curry, too–yours is even more appealing because it’s so colorful. I adore curries and since I cannot have have shrimps I am thinking of making this exact dish for my husband (who loves shrimp) and making another seafood version ( fish or imitation crabs) for myself. I love the spicy-curry taste! Delicious! I love curry and I love shrimp! Lovely recipe – I particularly appreciate the rice tips as well. I’ve been so busy last week and weekend that I couldn’t make it to Seafood! Arhh! Next time… I love curry with rice and this Thai curry sounds WONDERFUL!! I want to jump through my computer for this one. Looks terrific! This shrimp curry looks delicious! I love the addition of the green beans. I’ll have to try that! Great recipes this week! I’m going to hang my head in shame and admit I’ve never had curry. I know right. It’s sad. Yours looks fab. I’m going out for Thai tonight and I can hear Penang curry calling me from home. 🙂 Your shrimp curry looks beautiful. What an exceptionally delicious round up, K! I love shrimp anything and can’t wait to try out your curry! Yes! Finally something about cleaning services australia.